The PC version adds improved flashlight lighting and the ability to save at any time during the game. Fourteen of Heather's outfits from the PlayStation 2 version are not present in the PC release. The North American physical release had 5 CDs, while the European PC physical release features just one DVD. Configure the width and height and other options in Silent_Hill_3_PC_Fix.ini. WSMSH3 is an unofficial mod which implements widescreen resolution support for the FMVs. The PC version's FMVs have a resolution of the FMVs 512х384 and not support widescreen resolution. The WSMSH3 by Metallist improves the quality and upscales the resolution of the FMVs. Open op.000 with a text editor. Open kcet.bmp and konami.bmp with a text editor. Delete all contents and save the files. Use Widescreen Fix or sh3proxy. Disabled by default. See Force Vsync. Frame rate may fluctuate between 30 and 60 FPS. See Issues fixed. Frame rate is capped at 60 FPS. Increases the game speed when uncapped. Rendering resolution is actually internal framebuffer resolution. Use Widescreen Fix to customize. It is highly recommended to set the Brightness Level in-game to 5 to get the most contrast. 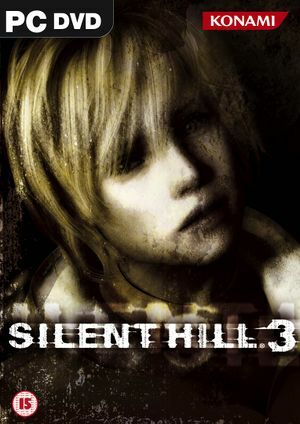 Download and extract Silent Hill 3 FOV Hack. Run the program alongside the game. If the program fails to run, install the Visual Basic 6 Runtime. If running the game as admin, also run the program as admin. Edit FOV options as needed. If using Widescreen Fix, simply decreasing Width FOV value is recommended. Press Numpad * to enable new FOV settings; Numpad / sets defaults. If needed, use the On-Screen Keyboard program built into Windows. If your only intent is to run the game in widescreen, it's recommended to use the Silent Hill 3 Widescreen Fix instead, since it also corrects all the 2D items/ assets/ menus width. Strong negative mouse acceleration by default. DirectInput only. For XInput controllers, see Controller support. Can be set between Soft, Normal, Hard, or Off. For XInput controllers, see Controller support. A fix is required for the game to recognize XInput Right Stick, LT/RT, LS/RS and D-pad when assigning controls. Force feedback emulation can also be enabled for XInput controllers. 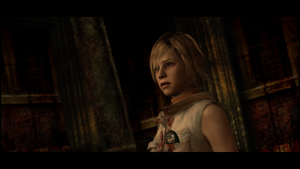 If using Silent Hill 3 Widescreen Fix, rename dinput8.dll to d3d8.dll. Set the Target Program to sh3.exe. Copy d3d8.dll to the installation folder. If using anti-aliasing (MSAA, at least), the Depth of Field effect becomes corrupted (halos around objects). Post-process AA (FXAA, MLAA) works as intended (best compatibility in conjunction with the D3D9-11 wrappers). The light sources affected by bloom leaves long dark motion trails on screen when camera is moving. Go to the ingame "Extra Optons" (second options tab) and set the "Display Mode" to "Sharp". Disabling the smoothing filter leads to more pronounced aliasing. Frame rate may fluctuate between 30 and 60 FPS. Both solutions won't work properly with a low FPS. Minimal FPS must be at least 50+. Install Widescreen Fix or sh3proxy. Tested options for the Right Stick to fix issues regarding the need to use the mouse to use search mode to its full potential.